1 - Shake the bottle before spraying it. 2 - Spray one side of your Microfiber cloth with Touch Screen Clean. 3 - Gently wipe your touch screen with the wet side of your Microfiber cloth. 4 - Turn your Microfiber cloth to the dry side and lightly dry and polish your touch screen. * If you apply Touch Screen Clean to a hot surface, or allow it to dry by itself, it may leave streaks. 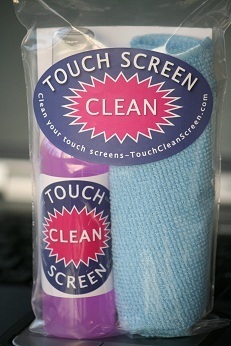 Only use the supplied Microfiber cloth for cleaning your touch screens with Touch Screen Clean. If your Microfiber cloth gets too dirty, hand wash it in hot water with mild detergent. Rinse the cloth thoroughly and allow it to air dry. Never use fabric softeners or heated drying on the Microfiber cloth.